Contrary to popular belief, acne doesn’t just affect teenagers. Twenty per cent of women aged 26 – 40 suffer in some capacity from the disease. There are plenty of questions surrounding acne. What causes it? How can it be managed? Why does one sibling suffer terribly, whilst the other has perfectly clear skin? First, we need to define exactly what acne is. Acne is a collection, or cluster, of reoccurring spots. It is a common skin condition that normally affects young people aged 16 – 25. Males are more likely to suffer than females. There is no cure for acne, but there are plenty of medications and creams available to treat it and manage the condition. You can even investigate laser or light-treatments to improve the condition of your skin. There can be several contributing factors to adult acne, but the main cause is the over production of sebum. Sebum is an oily matter secreted from your skin’s sebaceous glands. In women, this can be as a result of an imbalance in hormones, typically where male hormones (androgens) are over-produced. Acne can worsen during pregnancy and menopause as your body goes through even more hormonal changes. So, now we’ve identified what it is, let’s set the record straight and sort the truth from the lies. We’ve all heard how greasy food is supposed to irritate our skin, causing spots and greasy patches. However, there is no evidence to suggest that diet plays a part in skin management. That doesn’t give you a green light to devour a family sized bar of chocolate though! Eating a balanced diet is important for healthy cell growth in your body and for maintaining a safe weight. It’s what going on beneath your skin that triggers acne, not what you do on top of it. No amount of washing or cleansing will rid acne for good. In fact, if you’re washing your skin more than twice a day, you could be irritating it. Wash once in the morning and once at night using a gentle cleanser. Exposure to the sunlight has not been proven to cure acne, but it will reduce redness. This is because the sun supresses your immune system and the immune cells in acne. Make sure you use a light SPF if you venture outdoors, so it doesn’t clog your skin. A minimum of SPF 15 is recommended, even in the winter! The combined contraceptive pill can help reduce acne symptoms, although it may take up to year to see any results. Combined contraceptive pills contain a hormone blocker, which limits the amount of oil produced from your skin. It should be noted that the combined pill has been known to cause blood clots. The chance of blood clots are increased even more if you are a smoker or are overweight. When it comes to smoking and acne, the results are inconclusive. On the one hand, inflammation is actually reduced when you smoke. Much like the sun, smoking supresses your immune system and therefore reduces redness. On the other hand, smoking decreases the amount of vitamin E in your skin. Vitamin E is a vital ingredient used to protect your skin from free radicals caused by pollution and sunlight. Without vitamin E, the sebum in your skin can oxidize. This can aggravate acne. One thing’s for sure, as well as being linked to cancer and respiratory diseases, smoking will mess up your hormones. You may experience an increase in male hormones, a blood sugar level increase and a resistance to insulin. Ditch those cigs now! Dealing with unruly skin can be upsetting and demoralising. It’s important to keep trying different treatments to find one that best suits you. Eating a healthy diet will only help so much. Don’t beat yourself up if you think you are doing everything right, only to wake up seeing red (literally). There will be the right solution for you. You just have to stay optimistic and remember you are not alone. 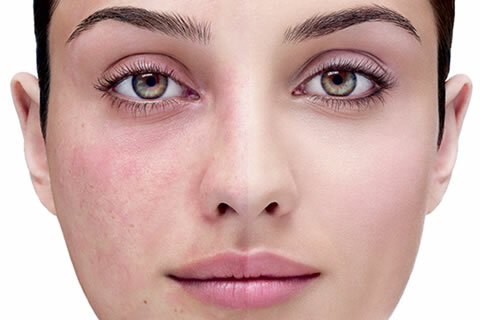 If you are suffering from acne and finding it difficult to cope, head over to a skincare forum and chat with other people who are in your position. The users will be able to offer a sympathetic ear and may provide you with new ideas you haven’t even considered yet. One thing’s for sure, don’t give up! Hayley B is a blogger for the online fitness workout website that stars Lucy Mecklenburgh from TOWIE – Results with Lucy.